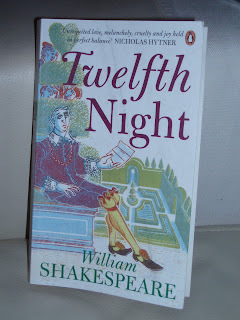 A girl for all seasons: The longest twelfth night! Well, I've eventually gotten to finish the book. It's not that I didn't enjoy it. I did, much to my surprise. The last time I read Shakespear, Miss Faye was droning on and on...... It's just that other cultural pursuits like Grey's Anatomy and Desperate Housewives kept getting in the way. I didn't understand every single line of it, but I didn't worry about that. I just went along with the poetry of the words and got the general sense of the language. Olivia certainly didn't play hard to get! She decided she wanted Sebastian and met him....with a priest in tow! There was no way he was getting away. Go Girl! Some are born great, some achieve greatness and some have greatness thrown upon them. I wonder if Shakespeare was alive today would he be writing for the tabloids?? ?